Offshore wind turbines are constantly exposed to harsh environments and suffer the consequences. Especially their foundations, which are moored in the ocean floor. From time to time divers have to descend to examine these structures for flaws. In the future these kinds of underwater checks will become easier and faster, with the aid of newly developed sensor ring. At Hannover Messe, held between April 25 and 29 this year, researchers will be displaying a system to achieve this. The pylons of offshore wind turbines are exposed to the waves, and the rotors are exposed to winds that shake them. So the base of the turbine located underwater near the ocean floor should be strong enough to endure severe stresses. Foundations can also be damaged by the corrosive saltwater. The divers task is to check the highly exposed welding seams of these anchor points and determine if they are still in good condition, or whether any defects or cracks have developed that may cause a safety hazard. Initially the divers blast the weld using a high-pressure cleaning tool to get rid of marine growths, such as crustaceans and algae, and this is followed by the application of an electromagnetic field to the weld to cover it with iron filings. In case a crack is present, the field is forced outwards and the iron filings will build-up there. All of this has to be done by the divers, who have to carry a lot of equipment as well as handle strong water currents. They also need to adjust to the varying water pressures during the dive. Currently, the inspection of a single wind turbine installation takes nearly a day. Going forward the diver’s tasks can be taken over by a type of robot, known as a box-shaped remote operating vehicle (ROV). A team of researchers from the Fraunhofer Institute for Ceramic Technologies and Systems IKTS in Dresden in collaboration with various industry partners is working on the foundation of this technology. We have developed a sensor ring that simplifies these measurements and will allow them to be performed automatically in the future. This sensor system has a number of advantages. Compared to other currently used techniques it offers better precision. It is capable of testing the depth and dimensions of cracks, which was not possible until now. Inspection using a ROV is much faster with the task completed in 10 minutes. The heart of the system is the sensor ring, which is placed around the weld and remains there for the entire service life of the wind turbine. This ring is made up of a number of sensor elements set like a string of pearls, with 5 - 7 cm spacing between them. The diver takes the measurements connecting a battery-powered handheld device to the interface port on the ring. Then, at the touch of a button, the analysis begins. This task can be performed by the robot in the future. The difficult task of cleaning the components underwater using high pressure can also be eliminated. Each sensor elements acts as an actuator. The first sensor element works by sending out ultrasound waves to hit the weld, which then gradually enter into the whole structure. The waves will be reflected back from the damaged area if they encounter a crack anywhere, otherwise they will pass unhindered through the undamaged areas. The next sensor element detects these signals, and the damaged area location can be determined. The third sensor takes on the role as an actuator, and facilitates data transfer through cable connection to a handheld reader. The data is then transferred to a computer. The researchers receive the data, which resembles the data obtained from a CT scanner found at a doctor’s office. In this case the offshore wind farm inspector receives a color-coded image of the weld, illustrating the damaged areas according to severity. 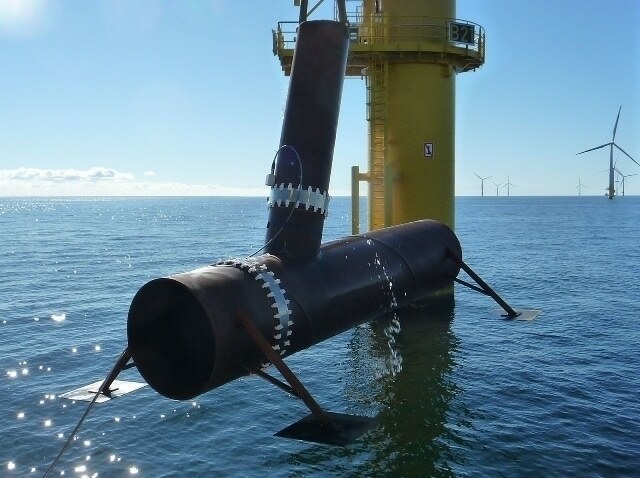 The researchers partnered with a team from Baltic Taucher in Rostock to showcase the feasibility of the technique in a real world trial at the Baltic 1 offshore wind farm. For the demonstration they lowered a branched metal pipe, with a manually created crack measuring 45 mm in length, 0.9 mm in width, and 7 mm in depth, into the Baltic Sea at a depth of 18 m. The demonstration was a success, with the system not only locating the crack with superior precision, but also establishing its height, length, and depth. In about five years the researchers hope to receive certification for this system and launch it for operation. Their goal for this system is to prolong the service life of the wind turbines while assisting the shift to new energy sources.